Are you a reader who is looking for something new to read? Then welcome to Dr Booklove’s Reading Challenges which have been designed to introduce you to a range of new things to read. New authors, series, genres, time periods – all sorts of things to broaden your horizons. Teachers and teacher librarians – the sole purpose of these challenges is to extend the child’s reading horizons and experience the joy of reading for pleasure. Challenges should not be mandatory nor reward driven. Please read my blog post to find out why. The best readers read often so work out how many hours there are in 2018 minutes and then work out how much you will have to read each day to read 2018 minutes this year. Make a progress chart so you can mark off the minutes each time you read and watch the total grow towards your goal. Think about all the places and times you can sneak in a read. Brainstorm ideas with your friends and see how many different places you can read. You will soon rack up the time and more! If you put the cursor over the top right of one of the forms you will see a pop-out icon. Click on that to get a printable version of the challenge so you can fill it in as you read. You can colour each challenge as you complete it and watch your reading grow. Try Book Bingo! Complete a row of reads – vertical, horizontal or diagonal. Or read all 25 options! Explore new genres – a style of writing that has a common theme or content at its core. Here’s a table of some genres if you’re looking for something new to explore. Set your own personal challenge. Think about what you want to achieve through your reading for pleasure this year. It might be something like completing reading a series or participating in the Premier’s Reading Challenge or participating in a school book club or maybe just reading one book from the beginning to the end. Make a poster so your goal is clear and so you can mark the milestones towards achieving it and watch your reading grow. Think about how you want to celebrate your achievement when you complete your challenge. Who do you want to share it with? How do you really want it acknowledged – a certificate, another book, something special? Negotiate a reward with your teacher, your teacher librarian and your parents so they can see you’re serious, you’re really trying and can encourage you to keep going when times get tough. Talk to to your teacher librarian about creating a space (in the library or online) where you can share recommendations of books that you’ve really enjoyed and that you think your friends might enjoy too. If you’re looking for something to lead you into a new challenge, it might be the place for you to start too! Share-a-Story is for the parents and carers of children who are not yet independent readers or who love their bedtime reading ritual as they read aloud, read along or read alone. If you need help finding a story, talk to to your local school’s teacher librarian or your public librarian. If you put the cursor over the top right of the form you will see a pop-out icon. Click on that to get a printable version of the challenge so you can fill it in as you read together. If your child is beginning to read alone, encourage them to be a hot reader with Dr Booklove’s thermometer. There is a lot of research about the appeal of having books displayed so the cover is easily seen. Here’s an idea from Jim Trelease to make a little library in your own home. 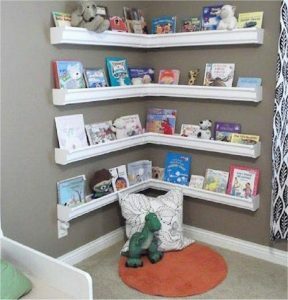 An idea from Jim Trelease (The Read-Aloud Handbook) Rain guttering and brackets create a special reading corner.